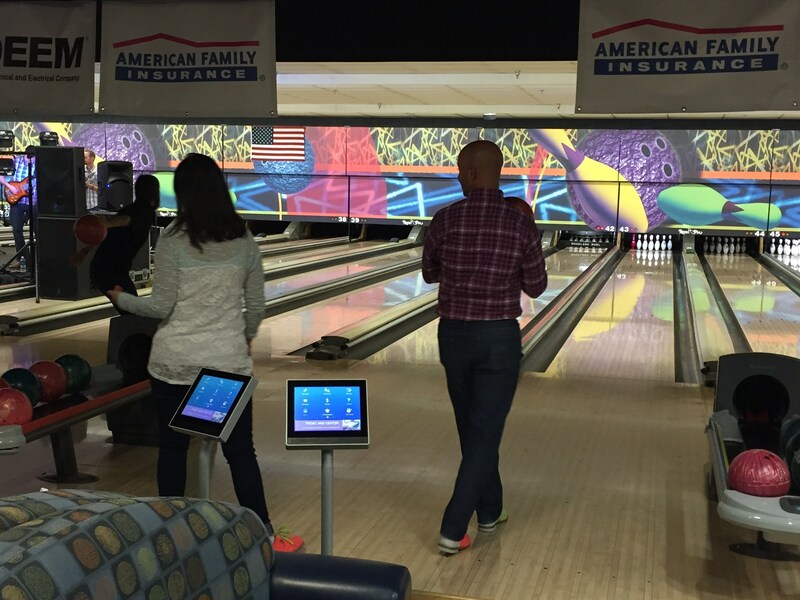 We were thrilled and honored to represent American Family Insurance, who was one of the title corporate sponsors at Monday’s fundraising event: Superbowl for Saturday’s Kids at Woodland Bowl, benefiting The Peoples Burn Foundation. Money raised at this event benefits Jeff and Karen Saturday’s “Camp Saturday“, a FREE week long camp in the summer at Flat Rock River Camp for any child age 5 to 18 who has suffered a burn injury. Camp Saturday is a week-long specialized residential camp for children who are burn survivors to heal from physical and emotional scars by providing opportunity “just to be kids” with volunteer counselors comprised mostly of firefighters and paramedics. The camp offers traditional adventures filled with therapeutic healing for young burn survivors for a week of summertime fun within a nurturing environment amongst their peers. Many campers were in attendance at Monday’s event to mingle with those who came to bowl and raise money for next summer’s camp while enjoying a yummy meal, compliments of Sullivan’s Steakhouse. Jeff and Karen Saturday welcomed everyone and spoke from their heart about why this event was so special to them and their campers. Per their bio on Camp Saturday’s website, The Saturday’s became involved with The Peoples Burn Foundation after their youngest son burned both of his hands on the glass doors of a lit fireplace. They learned first hand the long recovery process of a burn injury and how it affects a child. 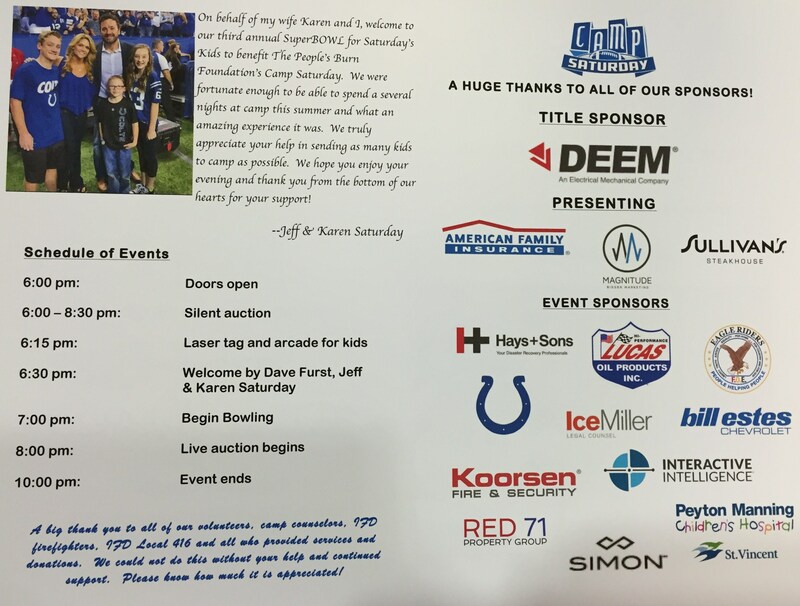 Former Colts Player and Superbowl Champion, Hunter Smith and his band, The Hunter Smith Band, performed live while we bowled and bid on silent auction items. (The band is AWESOME! Check them out – we all bought their CD, which Hunter Smith autographed for us. He was so NICE). We LOVED the shirts available for purchase from Zella Mae Inspirations. Every shirt they make conveys a positive message and for each shirt purchased Monday night, they donated a shirt to camp. We HIGHLY encourage you check them out! Amazing stuff! Girls V. Boys. We ALMOST beat them 1st Game. As part of the American Family Insurance “family”, we couldn’t be prouder that year round our company partners with & supports local organizations such as this in & around Indianapolis. American Family Insurance, year after year, shows up and validates why we became a part of this company 12 years ago.